PESHAWAR, Pakistan , Jun 28 2013 (IPS) - Women in Pakistan are no strangers to horror. In this country of 176 million, about 90 percent of women have experienced domestic violence; every year, over 1,000 women are murdered in so-called ‘honour killings’. Two years ago, the Thomson Reuters Foundation named Pakistan the most dangerous country in the world for women and girls. Perhaps the most appalling of these many forms of violence against women are acid attacks, which have become increasingly frequent, particularly in the rural parts of the northern provinces. The attacks themselves are brief, with the perpetrator needing nothing more than a bottle of hydrochloric acid and a few seconds to fling it on the face and body of his victim; but for the women who endure it, the effects last a lifetime. Searing pain, lengthy and costly medical procedures, permanent disfiguration and intense social stigma are among the most obvious impacts. Less visible are the trauma and loneliness that follow this crime. Just last week, an 18-year-old Pashto actress named Shazia Begum from the Pabbi village in Nowshera, one of 25 districts that comprise the country’s northern Khyper Pakhtunkhwa (KP) province, sustained severe burns after being doused with acid by a suitor. Shazia’s mother, Shamim Begum, told IPS that the attacker, a local film producer named Shaukat Khan, went into a rage when she rejected his offer of marriage. The next day, he scaled the wall of the family’s house and poured acid on the sleeping girl. Shazia was rushed to the Lady Reading Hospital in KP’s capital, Peshawar, where she was anaesthetised before doctors set to work sterilising her wounds. Like many victims, she was dangerously dehydrated, and as medics daubed antibiotic cream on her burns, she was fed a steady stream of fluids through an IV. Doctors in the hospital told IPS that most burn victims experience sufficient blood loss to warrant a transfusion. Though Shazia did not require this procedure, she will likely suffer from anaemia until her wounds are completely healed, they said. After two days of intense treatment she was sent home with painkillers, vitamins, and warnings that constant and long-term medical attention would be a requisite for survival. 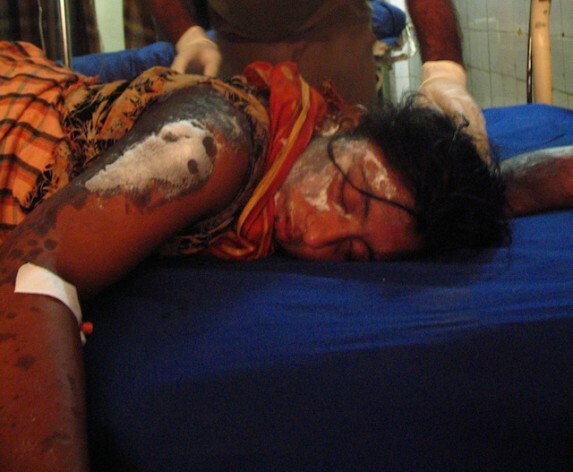 “We have received about 12 burn cases so far this year; eight of them had burns covering 50 percent of their bodies,” Dr. Abuzar Khan, a specialist at the hospital’s burn ward, told IPS. In 2012, 27 acid attack victims were admitted here but only four survived. Most die as a result of septicaemia caused by severe infections. The few that survive endure a veritable catalogue of medical problems: acid destroys the soft cartilage of noses and ears, causing deafness and loss of smell; lips dissolve, leaving teeth exposed and victims unable to speak or eat; eyelids are quickly and easily burned away, leading to blindness; even the skull is affected, particularly when the layers of dermis and fat burn away, leaving bones exposed. These effects do not only induce extreme, sometimes unbearable, pain, they also wipe out a woman’s chance of finding a husband, starting a family, or leading a normal life. Disfiguration, particularly in the face, neck and shoulders, is so intense that many victims end up as complete recluses, either hidden away by their families or too ashamed to step out in pubic. Earlier this year, 22-year-old Razia Begum divorced her husband in order to marry another man. Furious, her husband followed her to her new home in the Charsadda district of KP and threw acid in her face. She has since developed a burn scar contracture, a shortening of the muscles, tendons and tissues, for which she will now have to undergo reconstructive surgery. Few survivors can afford reconstructive surgery, which is made more expensive by a shortage of plastic surgeons in the region: according to Abuzar Khan, only 20 qualified plastic surgeons serve a population of 2.5 million people. A basic skin grafting procedure for a small area of the face costs 500 dollars, though the chances of subsequent infections are very high. Most of the men who experience acid burns – about 20 percent of all burn victims – sustain such injuries while working in factories that produce matches, he said, while almost all the women are victims of attacks by suitors or family members. A strict patriarchal culture governs all social interactions in this part of Pakistan, with both men and women forced to conform to rigid gender roles. Shame occupies a large part of the public imagination, including among men who are unable to find wives. This perhaps explains why most perpetrators are men whose marriage proposals have been rejected, said Noor Alam Khan, chairman of Voice of Prisoners, an NGO providing free legal services to acid survivors and juvenile prisoners. “Men want to deface those women who turned them down, and deprive them of their natural beauty so no one else will look at them… or marry them,” Khan told IPS. Valerie Khan, chairperson of the Acid Survivors Foundation (ASF), told IPS that her organisation recorded about 150 attacks in Pakistan last year, of which only 49 were reported to the police. A long history of indifference to domestic and gender-based violence dissuades a majority of victims from lodging complaints with the police, and allows innumerable perpetrators to get off scot-free. Now, experts say, new laws and increased awareness about the situation could act as a powerful deterrent to such crimes. In 2011 the government passed the Criminal Law Amendment Act, tweaking section 332 of the Pakistan Penal Code (PPC) to make acid throwing a crime punishable by anything from 14 years to life imprisonment. Police officer Muhammad Javid told IPS that in addition to the minimum 14-year sentence, attackers would be slapped with a million-dollar fine. Noor Alam Khan believes that strict implementation of the law, which effectively makes acid throwing a non-bailable offense, would send a strong signal to perpetrators that Pakistani society no longer tolerates such actions. But although “the conviction rate rose to 18 percent in 2012, from six percent in 2011 as a result of the law,” according to Valerie Khan, a concerted effort must be made to prevent high acquittal rates. Others say the government should regulate the availability of acid, currently available in general stores for about two dollars per litre. A draft law that would have banned over-the-counter sales of substances like hydrochloric acid lingered in Parliament but eventually failed to go through due to arguments that the product was crucial for everyday items like toiletries and batteries, and for mechanics and goldsmiths. But until strong measures are put in place, Pakistani women will live with the perpetual fear of meeting a similar fate as hundreds of their countrywomen. The men of Pakistan need to be educated that women are not animals that you can buy, or damage for life if they find you unattractive. There must be a ban on selling Acid at the corner shops so cheaply. And perhaps a new Law stating that what you have done to these innocent ladies, will be done BACK to you!!! Watch the Cowards beg and snivel not to have Acid thrown in their faces, DISGUSTING COWARDS!!! An eye for an eye. Who knew Pakistani men were DISGUSTING COWARDS, glad I’m born in another country away from these pieces of Sh*t.